I’m just letting you know that for the next couple months I’m going to be changing up my Sunday Salad column to a Sunday Sides column. This is to prep for American Thanksgiving (Sorry Canada) and for Christmas. It will be full of veggie side dishes (and sometimes mains) that will hopefully inspire your holiday tables. I’m also doing it because this time of year begs for hot dishes, and as much as I love salads, and I do, I am craving things warm and cozy. And now to begin! As sad as I am to see the summer go, and I am, there is something comforting about the fall. The cozy sweaters, the thick socks, the covering up your bad hair day with a cozy hat. I have been doing a lot of this lately, largely in my apartment. Why are you wearing so many layers in your apartment you ask? Because, my apartment is heated through radiators, and my landlord, who is essentially a slumlord, turns off our heating at night. Yes, that is correct. He doesn’t turn down the heat at night (from the very low temperature he keeps it at during the day), he turns it off. Let it be clear that it’s not like I have thick windows to keep out the draft (they are in fact so thin they rattle aggressively when someone playing music with a loud bass drives by) or I have heated flooring or anything like that. Friends, it is a high of 3 degrees celsius today (that’s 37 to you crazy non metric people). It is bloody cold. So cold in fact that I started keeping my oven on with the door open during the day to heat my apartment. The things we do for cheap rent. So, now that the oven is on 8 hours a day I’ve been roasting everything in sight so I don’t feel so wasteful of energy. Chickens, squash, carrots, apples. Nothing is off limit, as long as I can open the door every half hour or so to keep the temperature of my apartment up. No soufflés here, just straight up roasting. 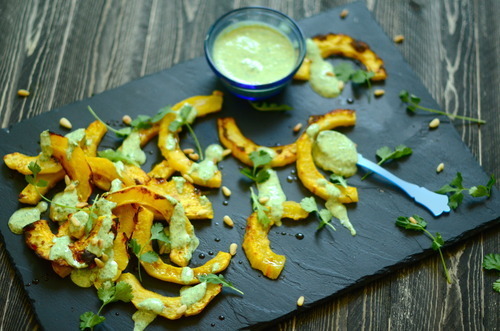 Peel your acorn squash. It’s a bit tricky to get into the grooves but try to be meticulous. Cut them in half and scoop out the seeds. Reserve the seeds! Toss them with some salt, pepper, and olive oil and and put them on one of your prepared baking trays. Roast unit they are cooked through, roughly 45 minutes. Meanwhile, put the seeds in a colander and wash to remove the bits of squash flesh. Toss them in more salt, pepper and olive oil and put them on the remaining prepared sheet tray. Bake until they are crispy- about 15-20 minutes. Open the open half way through cooking and stir. Combine all ingredients except the lemon juice in a food processor and pulse until combined. Add the juice to taste, so that it is zippy but not too sour. If you don’t have a food processor just finely chop the cilantro up and mix it all in a bowl. It will still be delicious. 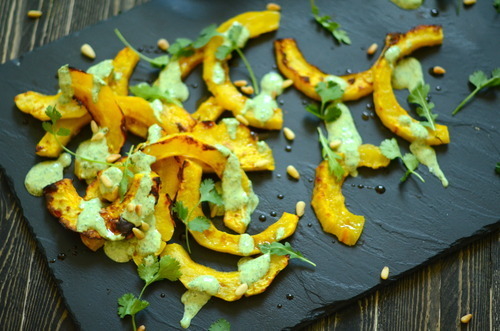 When the squash is finished roasting place it in a pretty pattern on your serving dish. Drizzle the pomegranate molasses on top, and dollop the cilantro dressing around. 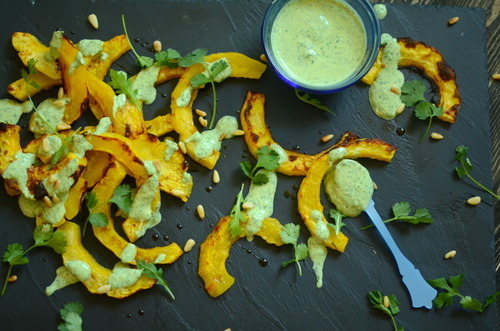 Sprinkle the squash seeds on top!